Johannes Joseph Maria van Halteren was born as the son of a builder in Amsterdam on the 14th of April 1893. He attended the Industrial School in Amsterdam and took private lessons in drawing and worked as a draughtsman for architects Jan Stuyt, Jos. Cuypers and P.J. Bekkers. After a brief period working for the government he registered as an architect in Den Haag in 1919. In 1920 he associated himself with architect W.Th. 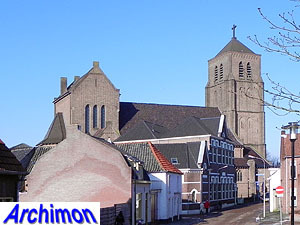 van Aalst in ’s-Hertogenbosch and later moved to that city. The cooperation ended in 1925, possibly because Van Aalst retired, but Van Halteren continued the office and used the name Van Aalst at least until 1928. 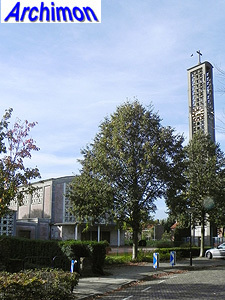 Van Halteren inherited Van Aalst’s major client, the Congregation DMJ (Dochters van Maria en Joseph, Daughters of Mary and Joseph) of ‘s-Hertogenbosch, who trusted him with a series of projects for schools, convents and chapels. The first such assignment, and probably Van Halsteren’s first assignment under his own name, was for Piushove, a housing building for priest students in Nijmegen, which was built in 1925-1926. 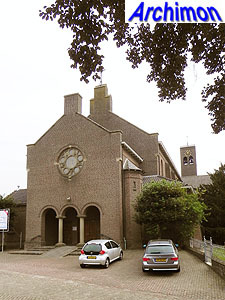 Another big assignment came in 1927, also for the Sisters DMJ, appears to have been for St. Vincentius in Udenhout, a boarding school for ‘retarded boys’, which was built in the Expressionist style of the Amsterdam School. The same style was used for schools in Amsterdam (1928) and Nijmegen (1931). 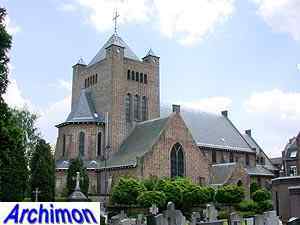 Although many of his assignments came from religious congregations and some of these buildings contained an internal chapel, it seems he did not build a strictly religious building until 1935, when he added a chapel to St. Vincentius in Udenhout. While in this design the influence of Expressionism was still present, Van Halteren soon switched to Traditionalism. It seems he was not involved with the traditionalist Delft School movement, and the catholic architects’ magazine R.K. Bouwblad never mentioned his name, but before and after World War Two he built several chapels and churches in Traditionalist style, often with centralizing (Christocentric) elements, until in the 1950’s he began combining that style with elements of Functionalism. Van Halteren died in ‘s-Hertogenbosch on March the 16th 1973. The following is a list of Van Halteren's religious works. It is probably incomplete. Cruciform chapel in Expressionist style. Three-aisled Christocentric cruciform basilica in Traditionalist style. Christocentric three-aisled cruciform chapel in Traditionalist style, with square crossing-tower..
Three-aisled cruciform basilica in Traditionalist style. Three-aisled pseudo-basilican cruciform chapel in Traditionalist style, with square crossing-tower. Three-aisled basilica in a modern style, built of concrete. To be demolished. Chapel for a hospital, building in combination of Traditionalist en Functionalist styles..